In a cocktail shaker, lightly muddle together herbs and sugar. Top with vodka and cranberry juice and shake with ice. Strain into a copper cocktail mug and fill with ice and ginger beer. Garnish with cranberries dusted with sugar and fresh herbs. To make cranberries, just rinse with water and then sprinkle with fine sugar. We took everything you love about a Moscow mule and flavored it for Christmas. Our holiday Moscow mule stays true to the original (i.e., lime juice, vodka and ginger) but we added fresh herbs and the unofficial fruit of Christmas—cranberries. The result? 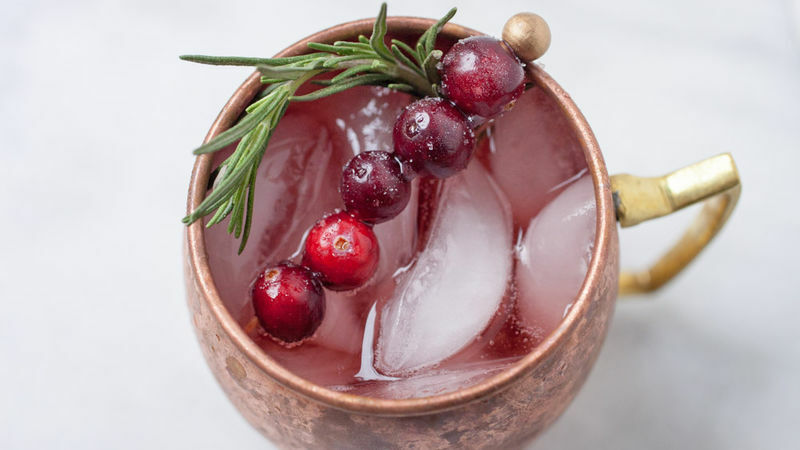 Sugar-coated cranberries that up the festive factor while rosemary and thyme give this mule a fragrant, warming finish. This holiday inspired mule is just as it should be: sweet, slightly spicy and oh-so-cheery. Whatever version of the Moscow mule you’re serving, we suggest pouring one up in a copper cup. Regardless of whatever ingredients you choose to use, is it really a Moscow mule without the copper cup? Celebrate any season with some of our other merry-making vodka drinks.